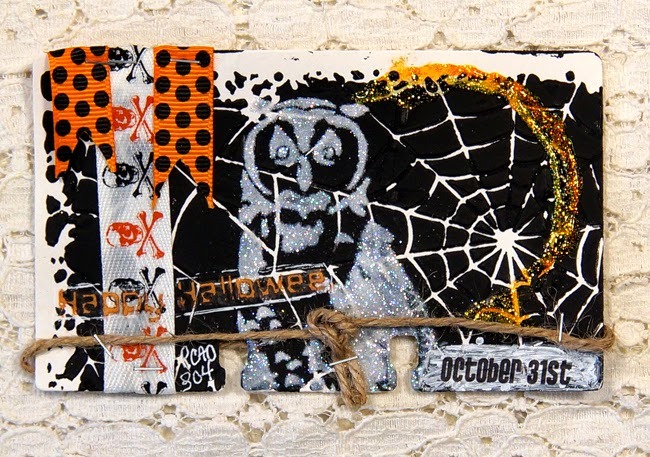 This is the last of the Halloween Rolodex cards. I sure do love creating cards with this theme. This card began awhile ago when I was trying out some molding paste, black gesso and a stencil. I had way to much mix up so I made a couple of back grounds. Then I stenciled an owl and sprinkled Dazzling Diamonds on it while it was wet. I used some stickles on the moon part of the stencil. I added some Halloween ribbon and rub-ons. I hope you have enjoyed the Halloween RCAD as much as I have making them.